Hot chocolate gift sets abound this year. They consist of a small tin of hot chocolate mix, a package of miniature marshmallows, a mug and a mini whisk and cost around $10. 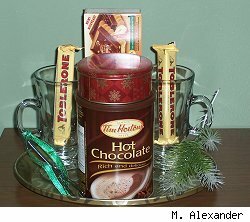 I like to put a dollar store spin on gift ideas I've seen elsewhere and thought it would be fun to expand the idea with some chocolate treats to enjoy with the hot chocolate. Unfortunately, you can't always find just the right things you need for a gift by shopping at the dollar store. What I did find was two glass mugs, a 10 3/4 inch-long gold metal tray, a two-pack of mini whisks, a small metal tin, a bag of miniature marshmallows and two Toblerone chocolate bars. I spent $7.30 as the chocolate bars are 65 cents each where I shop. To these I added a small package of chocolate covered butter biscuits and a tin of a popular hot chocolate mix, both bought at the local grocery store and spent just under $8. I filled the small tin with miniature marshmallows, tied a whisk to the handle of one of the mugs and added a sprig of greenery to the other side of the tray for balance. As a gift to be shared, I spent less than $7.45 per person and the tin of hot chocolate will last a lot longer than the ones included in similar gift sets. Also, I've still got most of a bag of marshmallows left. You could also opt to copy the store-bought gift more closely, in which case you would only need the hot chocolate, one mug, the tin of marshmallows and the whisk and the cost would be about $5.50, including a gift bag to put it in. On a similar note, if you don't feel right about giving Grandma a shower gel or body lotion you're unfamiliar with, head to your local drug store or Wal-mart and pick up her favorites. I found some Nivea Shower Cream and Body lotion packaged together for about $8. I put these together with my dollar store finds, an exfoliating bath sponge and a wire and vinyl gift basket and now have a very respectable-looking gift ready for some basket wrap. Marlene Alexander is a freelance writer and dollar store diva. She writes tips and ideas for decorating using only items found at the dollar store.